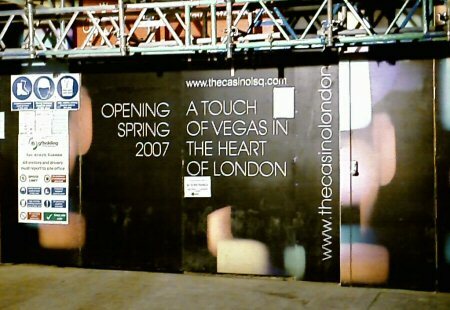 The Casino at the Empire in Leicester Square, which is apparently important enough to have two different web addresses listed on it’s boarded-up front, claims to be "a touch of Vegas in the heart of London". It’s a construction zone, so it’s hard to argue with that description so far. They’ve already removed the Empire sign from above the entrance, which is criminal. It’s not the original one, but it still feels like it’s been there forever. There’s no Neon Boneyard in London, so I can only fear the worst and ask for a moment of silence. So now why not go the whole Vegas hog and implode the entire West End? It probably woudn’t be out of the question if it was possible but of course the "Vegas-style supercasino" was awarded to Manchester, much to the disgust of everybody in Blackpool – a town which is now ripe for a systematic flattening and rebuilding. The Leicester Square casino will be the main host casino for the WSOP Europe, but even with a £10,000 buy-in (nearly double that of the WSOP Main Event) it won’t be big enough to seat enough the players and two other casinos will be used to whitte down the field. Their announced regular poker tournament schedule boasts an 81-player capacity, and that they will provide dealers for any events with a £100 buy-in or higher. That’ll be once a week, on a Tuesday.